Stem cells for COPD including emphysema: are we there yet? Chronic obstructive pulmonary disease (COPD) is a relatively common, often debilitating illness, which has a major impact on the people of the world. In the U.S. alone, COPD costs the country almost $50 billion a year not to mention untold suffering. Most of us know someone who has COPD. 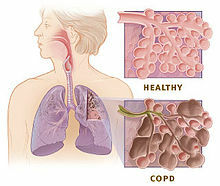 COPD is an umbrella term that includes chronic bronchitis and emphysema. Researchers are still investigating the causes, but two big ones are smoking and pollution. There are a number of treatments for COPD, but no cure, and the treatments, which can include supplemental oxygen, are largely palliative. A natural question that has arisen over the last 5-10 years is whether stem cells could be used to treat COPD. In fact, a number of clinics over the years have offered stem cell treatments for COPD, but these treatments are expensive and it is unclear if they work. For emphysema I found 3 stem cell trials, although 2 are completed and only one is still in the recruitment. One of the completed studies has results that seem inconclusive to this scientist. For COPD, I found 6 stem cell trials, including 2 recruiting. For Chronic Obstructive Pulmonary Disease as a search term, I found 12 trials here including a bunch that are recruiting. In principle, how would stem cells be used to treat COPD? How would this work? There are at least three ideas about how stem cells might benefit airway disease. First, transplants of the cells may build healthy lung tissue that is diseased or has been destroyed in COPD patients. Second, stem cells could in theory reduce inflammation in the airway alveoli (where respiration occurs) preventing further damage and perhaps tipping the balance toward natural repair. Stem cells may do this through so-called “immunomodulation” functions, perhaps via growth factors. Third, stem cells may stimulate the formation of new capillaries in the lung leading to tissue repair and better function. Whether stem cells can safely and effectively do these things remains to be determined over the coming years based on clinical trial data. There’s some controversy here as some doctors and patients believe (based mostly on observations from the clinic) that stem cells are promising enough for treatment of COPD that given the severity of the illness that stem cells, even stem cells expanded in culture that the FDA considers a drug, should be allowed to be used right now to treat COPD patients on a point-of-care, for-profit basis. Why am I not an advocate of that approach? There are risks associated with these kinds of treatments including autoimmune reaction (or immune reaction for an allogeneic transplant such as UBC), cancer, infection and, frankly, simply the unknown. Barring action by the FDA for any given clinic, patients must weigh the burden of their COPD versus the potential risks of unvetted stem cell treatments offered by said clinics all relative to the potential benefit of such treatments. In my opinion, these treatments today are not worth the risk, but others disagree with me. I am seriously consireding getting Stem therapy for my COPD , emphysema .. don’t know where to go ?? Since once a person has emphysema currently there is not a lot we can do, this will be a welcome treatment if it works out. This is going to be a great topic to follow.